Fabship is an off-grid FabLab, powered by renewable energy and Earthship-inspired design and systems. 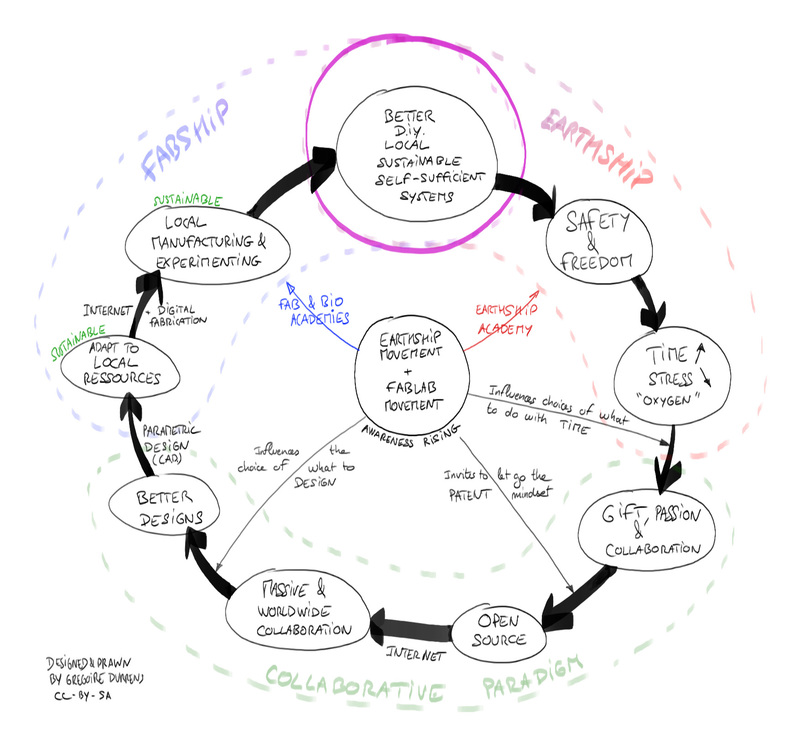 Fabships enable communities to build resilience and grow autonomy. By combining low-tech and digital fabrication technologies, Fabships foster innovation and low-cost alternatives to the growth-obsessed development model. In their parallel ways, FabLabs and Earthships have been challenging the limits of technology and sharing their learning openly; empowering citizens to become more ecologically conscious and technologically savvy. Fabships unite both movements under one roof; exploring the reach and scope of digital manufacturing within a radically sustainable and community-driven model. For the last 50 years Earthship Biotecture, lead by Architect Michael Reynolds, has been a pioneer in eco-construction, building off-grid homes with natural and recycled materials. Their projects include disaster relief and humanitarian builds around the world. Today Earthships are tried and tested models for autonomous and sustainable living. They address six basic human needs: comfortable shelter, renewable energy (solar/wind), sewage treatment, using recycled materials, water harvesting, and food production. These off the grid homes have been built in many extreme and diverse climates. 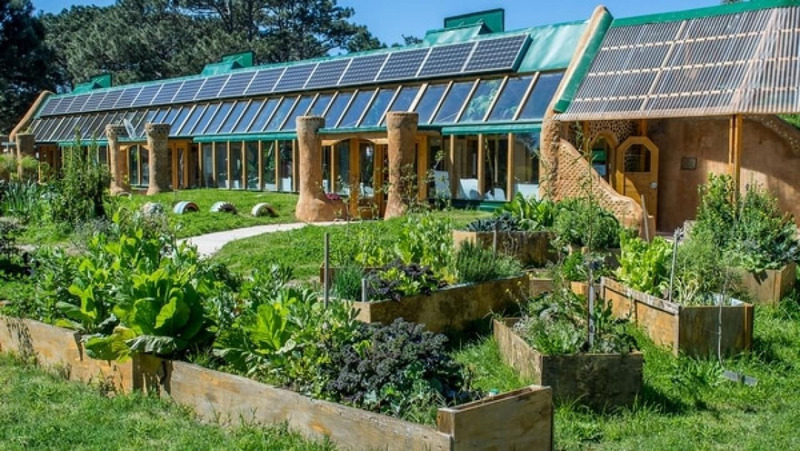 Earthships have evolved through many models, and as a result their designs and systems have gradually become more practical, affordable and efficient. Earthships provide energy-independent living systems that not only cover all the comforts of a conventional home, but also create a positive and regenerative environmental footprint. FabLabs are digital workshops for innovation and invention, providing stimulus for local entrepreneurship thanks to a suite of rapid prototyping machines, tools and software that allow people to design, invent and develop (almost) anything. They are also the educational outreach of MIT’s Center for Bits and Atoms (CBA), an extension of its research into digital fabrication and computation. FabLabs have grown to become influential platforms for learning, invention and collaboration. To be a FabLab means connecting to a global community of learners, educators, makers and innovators; an international knowledge network that spans 30 countries and 24 time zones. Because all FabLabs share common tools and processes, the program is a globally distributed platform for digital fabrication and open source technology. They are also pushing for a more sustainable model of manufacturing, democratising productive power towards a more circular and responsible economic model. Fabships are off-grid workshops that empower communities to grow their own productive power through energy efficient fabrication. As inter-independent and creative fabrication spaces, Fabships provide an alternative to the “take, make and dispose” mass-production mindset that is decimating our planet. By synergising the power of nature, technology and community, these off-grid maker spaces allow us to survive as well as thrive; building distributed local economies, engaged netizens and resilient communities. Fabships are not about technology as an end in itself. The aim is to build, repurpose and recycle; maximising a community's creative and productive capacity while minimising our carbon footprint. Fabships seek to develop a more intelligent means of production by applying tools to better serve our collective human needs and those of the Earth we all call home. Fabships, off-grid places for off-greed innovation. We gain awerness of co-existing in a fragile ecosystem when the limits of using, consuming, and disposing become tangible on an every day level. Defining these limits we discover the real costs of production, while fully owning the means to explore our creative freedoms. Energy independence sounds wonderful, but with it comes awareness and responsibility. Fabships research the boundaries between self-sufficiency and fabrication. How do we run complex machines using solely renewable energy? Does the natural phenomena dictate what we should be making or guide us to rethink how we can make it? How much energy does it take to make a windmill or replicate a machine? How can the model scale efficiently? These are all questions that Fabships aim to explore, experiment and experience. The idea is not to curtail, but leaverage the creative power of off-grid communities through a connected and distributed model of eco-conscious manufacturing. Building a FabLab in an Earthship is more than a technical challenge, it is the cross-fertilization of communities in the spirit of open-source learning and innovation. Both movements in their parrallel ways have been inspiring people to reclaim creative agency, build more intelligently, and rethink what we produce, how we consume and where we dump our waste. We have a unique opportunity in Taos, New Mexico, USA to build the first Fabship prototype. The Earthship community in Taos counts 100 residents and with the Earthship Academy and internship program, more than 400 students visit this place each year. This, together with the local team of experienced builders and teachers, makes this community an ideal case study to implement the first fabship. This prototype is meant to be replicated around the world to set up sustainable workshops where people can design globally how to build locally the world they dream to leave in with what the Earth and the Sun have to offer. We welcome your feedback and your involvement. We are looking for financial support to build and set up the first fabship. 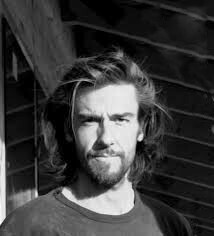 Gregoire Durrens is an engineer and eco-builder working with Earthship Biotecture. After graduating from the FabAcademy and attending the Earthship Academy, he was inspired to bring together the diverse approaches to the use of technology to solve our most pressing global problems. 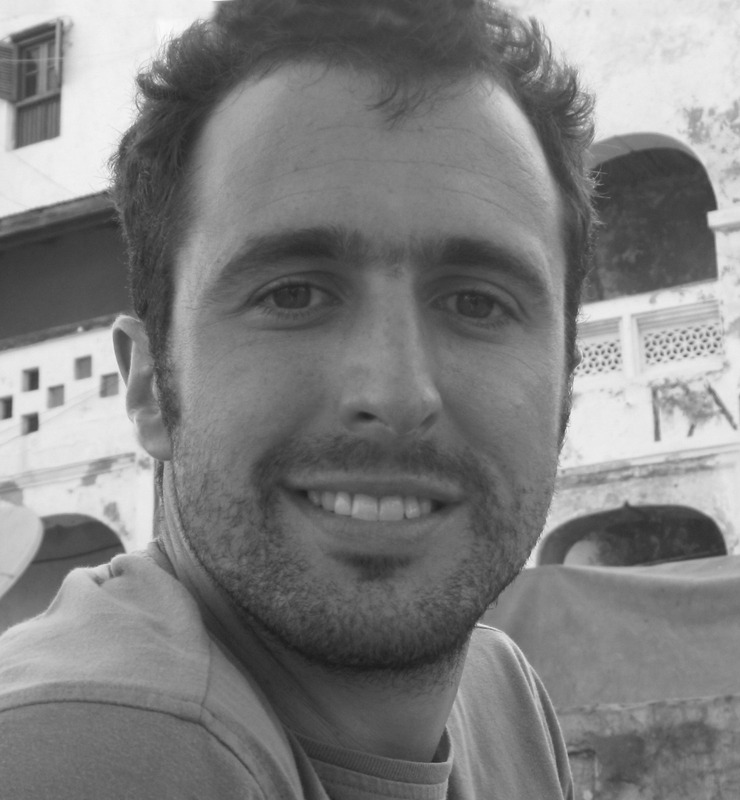 Nicolo' Gnecchi is a journalist and writer who has worked throughout Africa and Asia. Inspired by projects that are using IT for development, he discovered FabLabs working for the United Nations. He has graduated from Fab Academy and recently participated in an Earthship build. 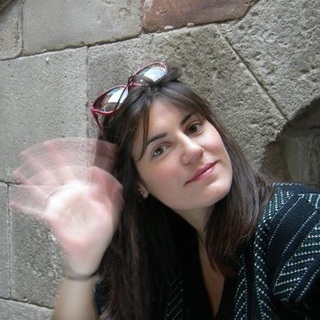 Anastasia Pistofidou is a Greek architect specialized in FabLabs and education. She leads the Fabtextiles research lab and the Fabricademy, a new textile and technology Academy. She also works as a content manager for the international fablab conferences.